This is a guest post by Charles Matovu, acting CEO of Kitovu Mobile AIDS Organization. As you meander through the hills of the Kanungu District, the dusty roads dotted with potholes, you can't believe that someone would have thought to lift up the health and social well-being of this remote community. HIV/AIDS has ravaged families here, and vulnerable children go without many basic human needs. My team from Kitovu Mobile was traveling west to visit the Nyaka AIDS Orphans Project, a well-respected organization working on behalf of HIV/AIDS orphans in rural Uganda. Nyaka strives to end poverty and hunger through a holistic approach to community development, education, and healthcare. This trip was a great opportunity for two development partners with similar mission statements to learn from each other; as fellow grantees of the Segal Family Foundation, we were eager to take part in this learning visit. Kitovu Mobile AIDS Organization is a faith-based organization under the Diocese of Masaka that provides holistic care and support to people affected by HIV and cancer. Through our programs, we offer counseling to patients, life skills training to orphans, and socio-economic empowerment opportunities to people affected by HIV. Together, Kitovu Mobile's three programs provide a full package of interventions addressing the causes and effects of HIV and poverty. Our model of home-based care and hybrid of community-based care has been recognized by Uganda's Ministry of Health. Our programs are strong, and, with our trip to Nyaka, we were hoping to gain insight to boost our communications and fundraising. When we arrived, Daniel Tumwesigye welcomed us to Nyaka's campus at the Blue Lupin Library. Five members of Nyaka's team briefed us on the history of the organization, which includes two primary schools, a secondary/vocational school, two clinics, and a water system. Every year, each primary school offers free education to 30 HIV orphans. The clinics provide free medical services to the orphans' grandmothers and guardians. The water system provides clean water to the school, the clinics, and the community. In addition, Nyaka's "Grandmother Program" offers house construction, voluntary HIV tests, improved farm inputs, and microfinance services to 92 groups of grannies, many of whom are subsistence farmers with no income stream. 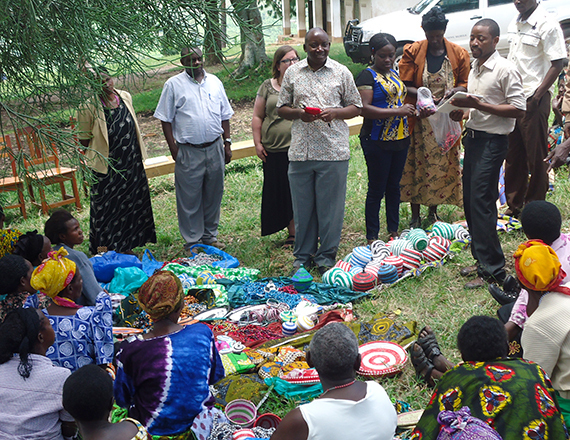 Nyaka helps the grandmothers fundraise for their needs by training them to make quality artisan crafts and identifying potential markets where they can sell their products. A user-friendly financial service has been established so that the grandmothers can save their money and access financial loans when needed. Our teams discussed how Nyaka's attractive website helps them tell stories of their impact. Social media has been key in their advocacy and fundraising strategies. Just last year, their visionary founder Twesigye Jackson Kaguri won the Waislitz Global Citizen Award, in part due to a strong presence on Facebook and Twitter. This has been made possible through close collaboration between Nyaka's international teams, since the American staff is skilled in filming, website design and management, and the local Ugandan team provides the content. Such collaboration sounded like a terrific opportunity to us: Kitovu Mobile has partnered with a GlobeMed (another Segal Family Foundation partner) chapter at Northeastern University in Boston to improve our website and revitalize our communications. We want more people to know about our excellent 25-year track record. We want more people to know that Kitovu Mobile is among the health facilities with the highest levels of drug adherence and patients' retention on antiretroviral therapy. Our improved communications can spread the word about our unique combination of spiritual support and continuum of care. After our visit, our team was excited to return home to implement the new ideas we had gleaned. The words of Nyaka's operating philosophy and guiding principles rang out in our heads: "We believe we are all one human family created by God, born equally, and have a duty to help one another."